The irony. Almost every city in the country has offered generous tax incentives to Amazon to attract their second headquarters, while the city council of the city with the actual headquarters has targeted them for a new tax on each employee as a response to rising rents and homelessness. Is this a policy that could spread to California? California cities, including Sacramento and LA, were among those offering Amazon subsidies while experiencing homelessness problems of their own. More than the revenue, the measure seems to also be about trying to get Amazon and other fast growing companies to stop growing and attracting new high-paid residents. It may work. Seattle is the #1 destination for people leaving the Bay Area, but may not be for long. Corporations like Amazon and Starbucks reacted angrily, and accused the City of financial mismanagement. Indeed, it seems those soaring rents and property values ought to be filling the cities coffers with tax revenues. This article suggests that Seattle City revenue has grown rapidly which raises questions about how much the revenue is needed. I also wonder how this might affect Amazon's HQ2 decision. It might make them more hesitant to go to cities with high rents, progressive politics, that have the potential to generate a Seattle like backlash in the future. That would seem to make LA, Boston, Denver, DC less attractive while potentially boosting places like Atlanta, Austin, Pittsburgh, and Columbus. 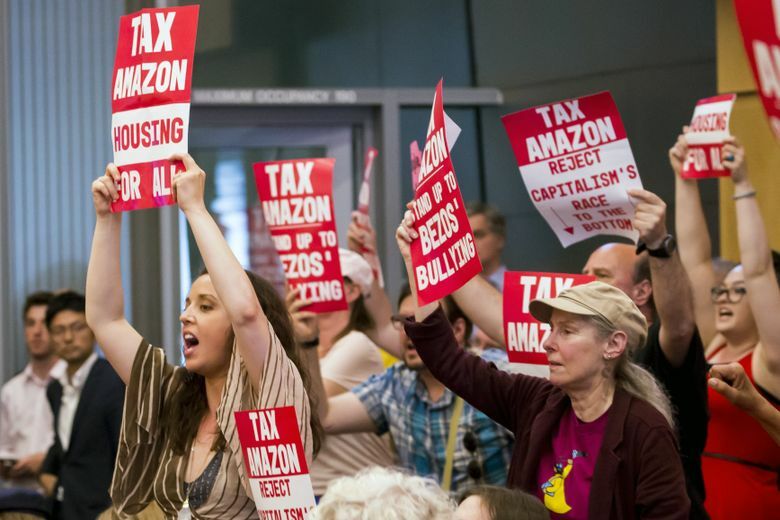 Update 6/15: Seattle repealed the tax this week, but I suspect it could still have an impact in how Amazon looks at cities for HQ2. I wouldn't be surprised if it makes them consider splitting up the project rather than create more Seattle situations.